In simplifying your kitchen, you’ll be expected to start storing your dinnerware and equipment in places close to where they are likely to be used. For instance, the pans and the pots should be stored near the stove while the dishes ought to be stored close to the dishwasher. When it comes to the things that you use most often, like the knives, you should store them close to the work counters like below, on or above the counter. Though you’ll hardly ever come across a kitchen with ugly kitchen storage cabinets, it’s sad to say that lot’s of them have not so attractive interiors. It’s therefore important that you re-design their interiors (drawers and shelves) so as to make storage easier and also, make it easier for one to access the stored equipment/dishes. Examples of way through which you can upgrade your storage cabinets is by installing roll-out and adjustable shelves, vertical tray dividers as well as drawer dividers. In most homes, you will find that the kitchen is not just an area where meals are prepared, cooked and served but also, the room where kids do their homework, keys are hanged and books (recipe books and magazines) are stored among other things. Point is, the more activity there is in the kitchen, the higher the chances of it becoming hard to manage. Thus, you should get your family to change this trend and instead, find alternative places to engage in those other activities. Adopting a simple yet elegant design for your kitchen can in many ways simplify your kitchen. As such, you should never use more than two materials for the same purpose (like in tiling), use too many paint colors (one or two are enough) and, don’t use too many aesthetics to the extent that they leave the room looking too busy. Lastly, ensure that the kitchen is well spaced, is airy enough and has enough windows to let in natural light. 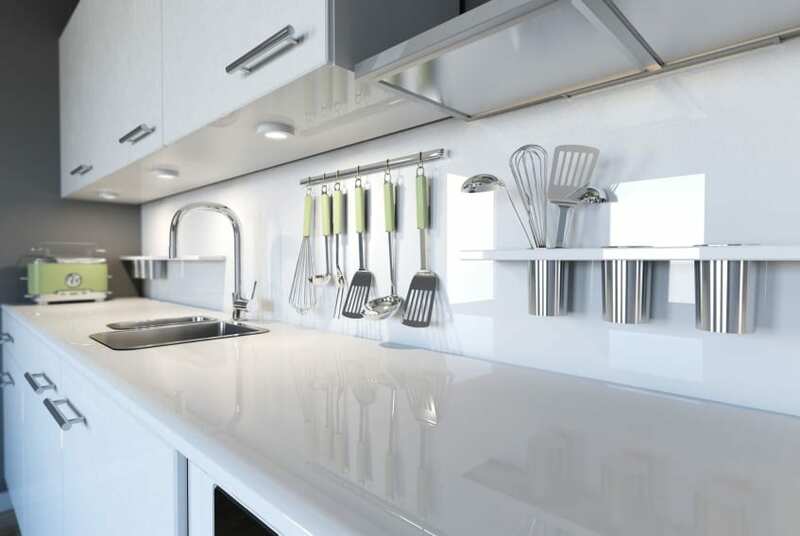 No matter how simple a kitchen is, if it has dirty dishes on the sink, un-emptied trash bins and too much stuff all over the floor or walls, then, it’ll definitely look busy. It’s hence advisable that you clean the dirty dishes as soon as they have been used, regularly empty the trash bins and, get rid of anything that clutters the kitchen, like kids’ paintings and magnets on the refrigerator walls.